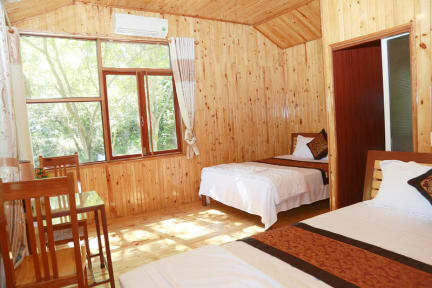 Phong Nha Midtown offers big rooms with two queen size beds, private bathroom, air-conditioning, hot shower, free wifi. Every room at this hotel is air conditioned and is fitted with a flat-screen TV. Certain units feature a seating area where you can relax. Some rooms have view. 1. Guest can pay by cash or card, but credit card we charge 3% tax. 4. Must be 18 or older to book a room. 7. Cancellation Policy: Please let us know before you check in one day. I can't speak highly enough about this hostel, primarily because of the owners Tien and Thuy who may just possibly be the two nicest people you'll ever meet. 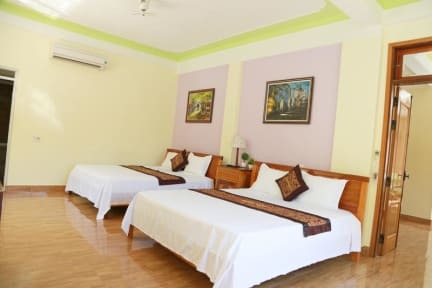 The actual hostel is right next door to the social backpackers' hub (Easy Tiger) and the amenities are very clean and respectable (with plenty of A/C which is a big plus in SE Asia). Tien and Thuy were very accommodating to our cave excursions and even let us leave our bags while we explored the town, even after we checked out. Me and 2 friends stayed at the Midtown for 3 nights. The room was large and we had 2 double beds between us which were very comfortable. The hotel was in the perfect location, in the middle of Phong Nha. Although the hotel itself was quiet, it was right next door to east tiger which is really lively and fun every evening! So it was nice going home to somewhere quiet. The hotel host was was also so lovely and kind and helpful and even made us breakfast to take with us on our early morning bus. Tuey the receptionist was very welcoming and helpful during our trip. Although no social atmosphere in the hostel itself, it is located just next to easy tiger which seemed like the only happening place in the entire street. The rooms were clean with big beds. We had our own privacy and quiet in the double bed private room. We reached the hostel at around 04 am by the night bus and were allowed early check-in at no extra cost. This place is right in the heart of town. The front desk staff are absolutely amazing at assisting with bookings! They even got up at 4:00 in the morning to help us get on the bus. They do have scooters for rent which will make it around as you explore the national park. It is clean but not luxury however our room was VERY clean and did have a nice tropical view. Easy Tiger hostel is just next door and karaoke until 11:00 was a bit frustrating but nothing Midtown Hotel could handle. Great place! Lovely staff, breakfast and rooms. No atomosphere but right next door to Easy Tiger. Smart TV in the room was also a nice touch. Lovely staff and perfect location. Not much going on but it's right next to Easy Tiger. Accomodations are basic, but they are clean, well located, and staff are friendly. Only down side for us was tv and air con remotes didn’t seem to work, even with new batteries. Also being next door to Easy Tiger Hostel, it is quite noisy at night with the crowds and music, although honestly this didn’t effect my sleep. The staff was nice. Other than that, the accommodation is very basic and something in between a hostel and a hotel. The room is very sandy so you can't walk around the room without shoes.